Beginning on Wednesday 30th January for 10 successive Wednesday evenings from 7:30pm to 9:00pm in Turner’s Cross Parish Centre (located on left as you enter the church car park). 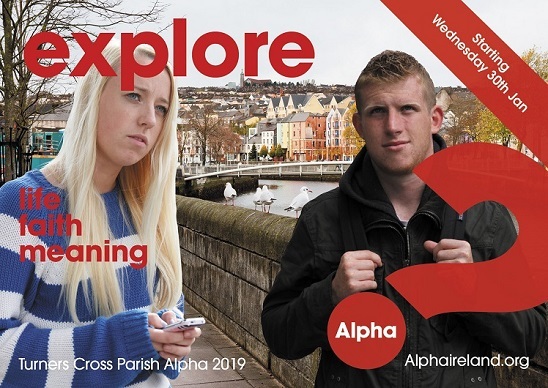 Alpha is low-key, relaxed, friendly and fun and help you to deepen your relationship with Jesus. Each session begins with tea/coffee, food and a time to chat followed by watching a dvd and listening to an interesting talk, and then we divide into groups to discuss questions relevant to the teaching. Alpha is free to all who come! and each Alpha group is limited to 20 people.